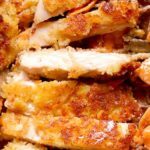 Parmesan Crusted Chicken - What's In The Pan? Do you make chicken dinners a couple of times a week? 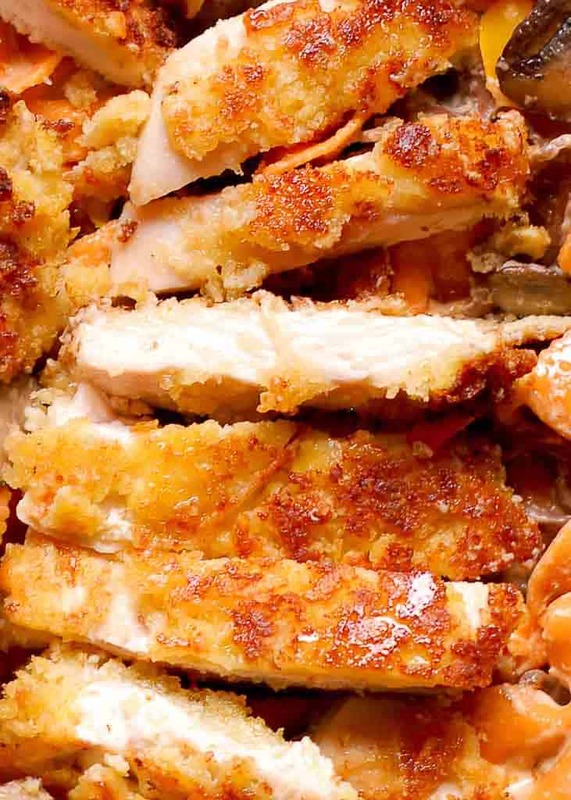 Then you and your family will love this easy Parmesan Crusted Chicken! It’s perfect for quick and easy weeknight dinners. Chicken breasts are super juicy and tender thanks to the fast cooking method. Mm… It’s also good that the chicken is also crispy on the outside! Trust me when I say that. 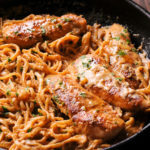 If you love cooking, you will find that this pan fried Parmesan Crusted Chicken recipe pairs up very well with pasta such as Louisiana Chicken Pasta, or Baked Ziti. I also love serving it over Instant Pot Mashed Potatoes. It’s a perfectly easy chicken recipe for a quick and delicious dinner. So delicious and simple! What kind of chicken works best? The chicken that works best is thin, flat and even. If the chicken you bought is thick as it usually is, make sure to half each chicken breast horizontally. Once you do that, you get 4 thin chicken fillets. Just perfect, isn’t it? 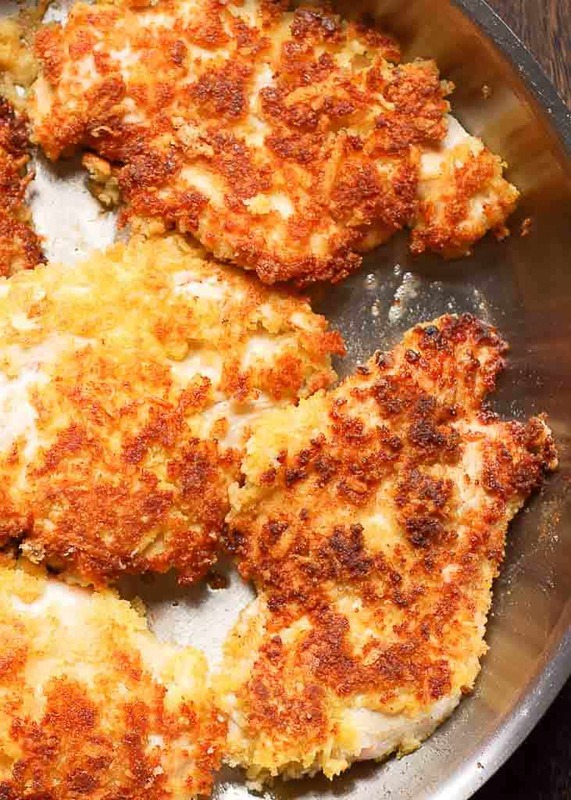 You can also use chicken tenders to make parmesan crusted chicken. What cheese to use? Cheese, oh cheese! I used store bought shredded Parmesan cheese. But I do recommend to use the fine shredded cheese or grated cheese. The finer you grate you Parmesan cheese, the better! You can even shred your own cheese. Especially if you happen to own one of those lemon zesters at home. I always use it to shred my cheese! I get such a nice fine shredded texture from my Parmesan cheese block. By the way, thinner cheese texture will also help it stick and stay on the Parmesan crusted chicken better. How should I season chicken breasts? When I make this Parmesan Crusted Chicken I always prepare a special dredging mixture. 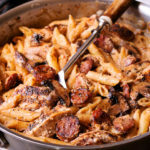 This delicious mixture includes salt, pepper garlic powder and dried Italian seasoning. However, when I have fresh herbs available I use those. I love fresh rosemary or thyme and use them instead or along with the Italian seasoning. How should I coat chicken breasts? First, paper towel dry the chicken and then prepare two bowls. One is for the egg, salt, pepper and seasoning. The other bowl is for the parmesan breading mixture. Next, you should whisk the egg slightly. Now it’s time to dredge each chicken breast piece in egg mixture. After that place in parmesan mixture and press. Turn to coat the other side of the chicken with parmesan mixture and press again. Repeat with remaining chicken pieces and place each coated parmesan chicken onto a plate or a cutting board. Before I made this Parmesan Crusted Chicken recipe, I had no idea what an easy chicken recipe that was! 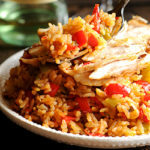 And what a a great option it is for a weeknight dinner! I liked it so much that I made this parmesan crusted chicken recipe in various combinations. It’s so versatile! 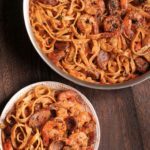 You can use it as a main dish, or accompanied by pasta. You can also slice this chicken and use it in your salad. I love having a salad with this Parmesan Crusted Chicken. I can slice it up and serve it along this healthy salad Spinach Salad, or this warm Brussels Sprout Salad. Just make sure to slice it! You can also serve these chicken breasts with Creamy Pasta or Mashed Potatoes. And finally enjoy it with cooked vegetables, such as spinach or broccoli. 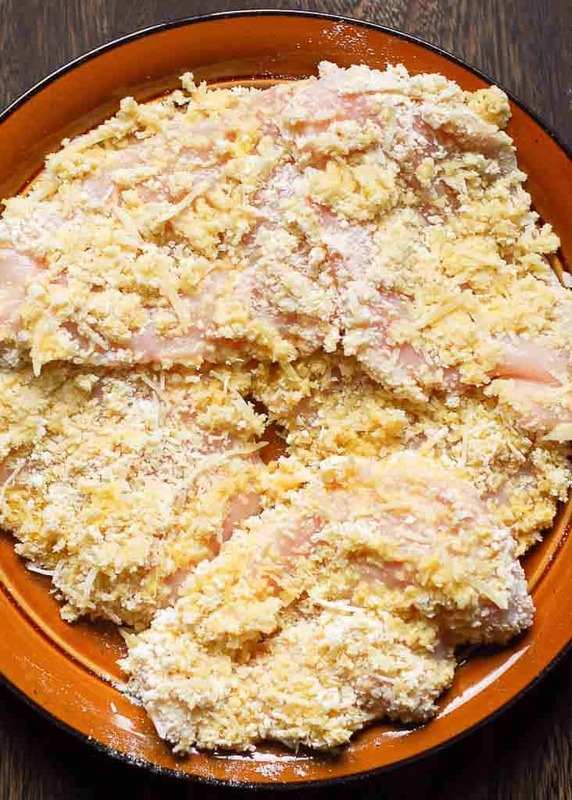 Thin chicken breasts are are coated in Parmesan, egg, and bread crumbs, and pan seared until crispy! Kids love it and so do the adults. First, paper towel dry the chicken and then prepare two bowls. One is for the egg, salt, pepper, garlic powder, and Italian seasoning. Next, you should whisk the egg mixture slightly. The second bowl is for the parmesan, bread crumbs and flour. Now it’s time to dredge each chicken breast piece in egg/seasoning mixture. After that place in parmesan mixture and press. Turn to coat the other side of the chicken with parmesan mixture and press again. MELT butter and ADD olive oil on medium high heat in a skillet (stainless steel, cast iron skillet or non-stick). PLACE COATED CHICKEN in skillet and cook for 3-4 minutes one one side. DO NOT MOVE chicken otherwise the cheese will slide off surface before it adheres! Press down lightly with a spatula. TURN WITH TONGS when the first side is golden brown and cook the other side for 3 to 4 minutes. Do not cook for more than a total of 6-8 minutes – just set the timer and flip when it beeps. CHECK FOR DONENESS to make sure the chicken is fully cooked and not pink. If not, lower the heat and cook for a couple more minutes. Do you ever find yourself struggling to reheat chicken the right way? I do too! That’s why I recommend eating this Parmesan crusted chicken fresh out of the skillet. But if Ido have leftovers this is what I would usually do. I simply heat up parmesan crusted chicken breasts in the oven to get the coating crispy once again. I wouldn’t suggest microwaving them. Microwaving will put too much moisture into the chicken crust and the coating won’t be so crispy any more. I was surprised at how great this turned out. Made some mash potatoes with chives on the side for dipping. Whole family loved! This was a huge hit with my husband. He wants to know when I’m making it again. Thanks! Delicious!! My family loved this chicken dinner! I served it with Cavatappi pasta and either a tomato basil sauce or pesto sauce on top (we have picky eaters!). We’ve added this to our favorite recipes rotation! Thank you! Thank you TJ. I’m glad your picky eaters loved it! I made it with pasta yesterday for my picky eater as well. Could this be baked as well? Yes, it sure can! I bake it at 375 for 20 to 30 minutes. Olga, After Cracker Barrel introduced a couple recipes using Parmesan Cheese, (which are delicious) I decided to try this and boy am I glad I did. It is very, very tasty! Made just as the recipe stated! Thanks for expanding my chicken recipes. I’m so glad you liked it Terri! I made this the other day and it was delicious! I have left overs, how long would you suggest reheating them? I always use either stove top or oven method to reheat chicken. I would reheat the chicken for 4-5 minutes on stove top on medium high, turning once – in olive oil. Or, bake it at 350 F. for 20 minutes on a baking sheet.